Asomiya Pratidin (Assamese: অসমীয়া প্ৰতিদিন) is the largest circulated Assamese daily newspaper. Founded in 1995, the newspaper has four editions -- Guwahati, Bongaigaon, Dibrugarh, and North Lakhimpur. 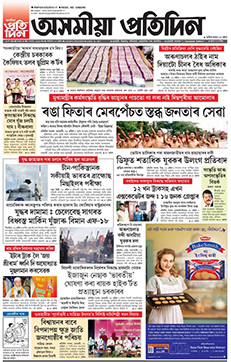 Like the newspaper, even the Asomiya Pratidin epaper is also extremely popular in Assam. The headquarters of Asomiya Pratidin is in Guwahati, and Nitya Bora is the Editor of the newspaper. The other publications of the group are Sadin, Xatxori and Nandini. The newspaper group also owns the popular Assamese satellite channel Pratidin Time.